Pastel – Mixed Media including Inks on Micro abrasive Surfaces – delivered with passion. Watch a video, click here, this is the sort of thing I would do at a demonstration, although I would do 2 or more during the session, always different, always exciting. I talk about composition, tonal values and explain how i create my compositions and why it is so important. How to create atmosphere, light, energy and movement. Always different, always fun and exciting. I love to paint live, and thrive on an interactive audience. 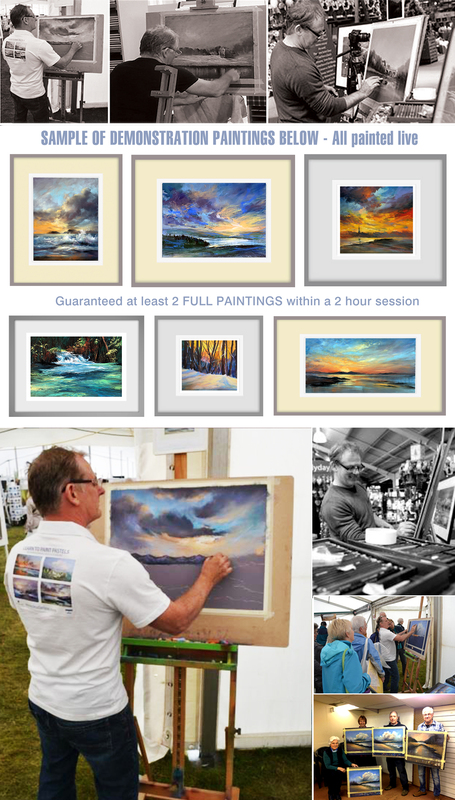 If you have an Art Society and Would like a demonstration in Pastel, give me a call. My charges are £125 for a 2 hour demo plus expenses (travel costs). Will cover all UK. Sometimes the distance an artist has to travel can create problems. Some groups get together with other local groups to bring artists form further afield… This way, the travel costs can be shared between the groups making it cheaper all around. I would generally do 2-3 paintings during the evening, on various Papers. If your group leaves email addresses after the event, I will send lots of information about pastels and papers to them, including a FREE tutorial. Why not arrange a Demo, followed by a workshop the following day. You organise, at your venue for 10 students and, I will provide, 12 Easles, 12 papers, 12 sets of Pastels 12 Towels and 12 Boards… Free and expressive. Guaranteed results and a fun day. Hi Les “Everyone comes out of a Les Darlow workshop feeling as though they have produced a masterpiece.” He is an excellent and enthusiastic tutor – going through the process in easy-to-follow stages, and providing individualised advice ranging from equipment and materials, composition and design, using effective underpaintings and application of the pastel and marks. He encourages a delicate approach using hard and soft edges and his mantra of “Less is more” ensures excellent results without overworking. I have now been on 3 of Les Darlow’s workshops and each time have been thoroughly delighted with my picture and with the techniques I have learned during the process. All in all Les quite the best response to any professional demonstration I have arranged in the past five years. Alan- On behalf of Leyland Artists. What an amazing artist we were privileged to have at W.A.G. yesterday. The energy he used in the way he put the pastel on paper was unbelievable, no other artist paints in that way. The way he talked about the beautiful pastels, his advice on value and composition was inspiring. The finished paintings he produced in record time were so beautiful, no wonder he was clapped so much. The ladies and Derek from Elise’s class were really blown away with him (I spoke to them at break and later). He was a real treat for everyone. Thanks Dave and please can we see him next year. Just to say a big thank you for your two brilliant demonstrations last Wednesday and the workshop on Saturday. Everyone has commented on how good they were and to do three paintings in each demo session is a first. We will be booking you again next next year at Shefford and Sundon Park.With regard to the workshop, it was a personal achievement for me to complete a painting in the one day when I am well known for taking too long!! 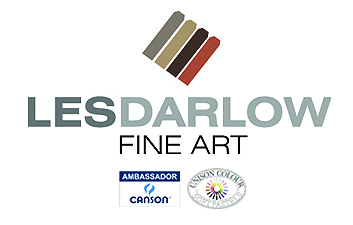 Whilst visiting the Birmingham Art show in 2014 ,I came across an artist Called Les Darlow demonstrating pastels . I was so impressed that I later booked him for a Demonstration and Workshop in February this year at my Bedfordshire Art Club. During the two hour demonstration Les gave us three different, very colourful paintings all of excellent quality and content. The following Workshop was also a very informative and rewarding day for the club members and myself . As a result of these impressive and memorable event days,I have now rebooked Les for a further two sessions in April .